Put down your pens; it's only the bloody Bank Holiday Weekend! Okay, I know the weather might be a little crumby (probably more than a little - it's currently hailing as if the world's going to end), but rain or shine, a three day weekend is nothing to be sniffed at. That extra day is yours to indulge in - stay in, go out, do whatever you want - but most importantly, have a Sunday Funday without the worry of Monday morning! Bliss. If you need a little Bank Holiday inspiration, we are here to help. We have some great food and drink recipes from previous years *here* - the Whisky Maple French Toast is a definite winner! Though we now also have our Top 10 boozy snaps of the week; #VinspirePOTW. Fizz, cocktails, coffee and carbs… Weekend, let's be having you! We'll start as we mean to go on - FRIDAY FIZZ! Theofficialselfridges have started selling 'Skinny Prosecco', which seems perfect for the weight conscious fizzaholics. What makes it skinny? It has 50% less sugar, meaning it's under 70 calories per glass. Practically guilt-free. Our friends over at murraymcdavid held an evening of cocktails, canapés and jazz in Cheltenham this week. The heart shaped chocolate shells, filled with rich chocolate ganache and a pipette of their 35yo Crafted Blend, Bodach Aislig won us over. Special mention to LoveBites catering for these! Csagerwilde is one of the many queens of wine in the UK right now. Her Insta feed gets me every time; beautiful snaps, beautiful wines... Follow her and get green with envy. We've featured sandowslondon on Vinspire a few times before (look here), and this stunning mid-pour shot made us crave more. Cold Brew & Tonic made with Fever-Tree is just the kind of grown-up non-alcoholic drink we like... However, if you want to add in a splash of gin for a CBG&T, that's totally acceptable too. 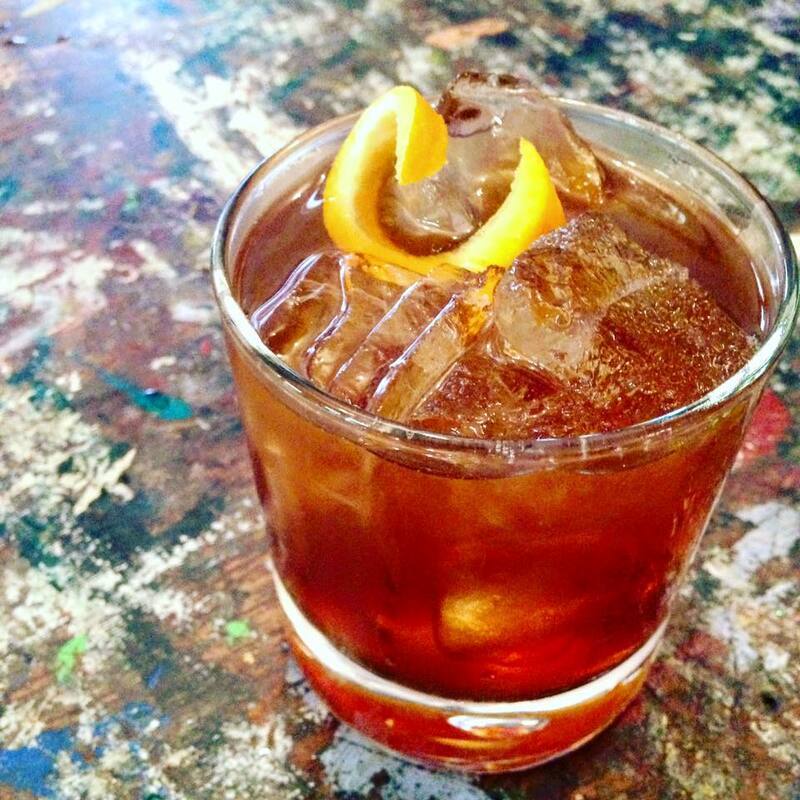 Rich Woods (aka the_cocktailguy) is one of London's best bartenders. Always pushing the boundaries, you can find his extra-special cocktails high in the sky at the 24hr restaurant Duck & Waffle. His current menu, 'Drink Your Greens', showcases how the humble veg works just as well in cocktail form. Try a Celeriac & Bee Pollen Bellini, an Artichoke Negroni, or a Pina-Kale-Ada amongst others. You'll never look at cocktails in the same way again. Did you know that rhubarb is technically a vegetable too? Bellitabristol treated us to this pretty in pink photo this week; bunches of British rhubarb which were destined to become a rhubarb and blood orange shrub. Vinegary shrubs are super popular at the moment, particularly when mixed with booze. Bellita's Pinky & Perky Shim is a mix of Campari, vodka and the said shrub. Give me one NOW. Possibly the most perfectly poured coffee ever. Thanks for the photo twizz_3seas! Also, whilst we're here, you coffee geeks should probably check this out - genius. Borough Market has a new carb-y hangout; Padella Pasta. Despite not including the fat worms of pasta that seems to be everyone's favourite dish (Pici cacio e pepe), this photo by hungry_anja says it all. THAT burrata, THAT bread and olive oil, THAT marble table top and THAT gorgeous wine glass (plus the actual wine). So so desperate to go! Lastly it's our Friday Cocktail! This time from the best cocktail bike boys, travellingginco. New season means new drinks, and here we have an Earl Grey '75. Mix 50ml Earl Grey infused Plymouth gin with 15ml lemon juice and 15ml maple syrup in a flute. Top with 100ml Champagne and add a few dashes of rhubarb bitters.